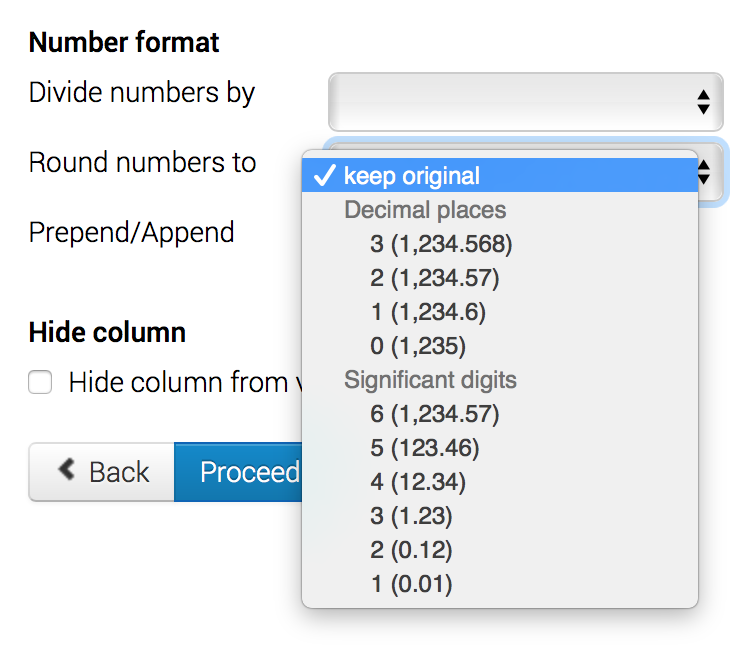 In step 2 of the Datawrapper workflow you find several helpful, time-saving options to "customize the column format" and transform the numbers, usually for easier understanding. These features effectively mean that you can always upload data as they are are and then refine them in Datawrapper, with one click. To see these options click on one number column, then check the options on the left. 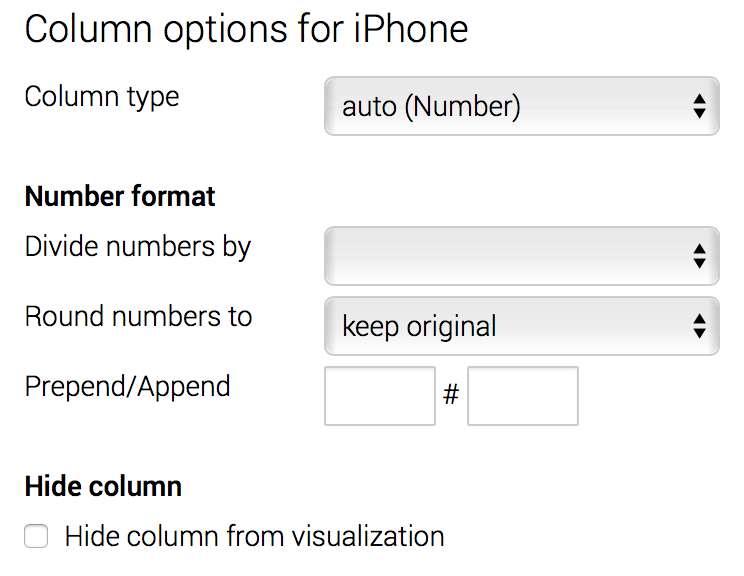 In the example below "iPhone" is the name of the data column. Datawrapper will automatically detect the type of data in your column when importing the data. However, if this is not correct this might affect the chart (e.g. you get a tooltip saying "insufficient data"). In this case you can always go back to step 1 and assign the intended type. As a general pre-set Datawrapper constantly saves your data, so going back and forth does not lead to loosing anything. Options in Column type: Text, Date, Number. All of the data will be properly aligned based on the column type: Text is always aligned left, Dates are aligned to the center, numbers are aligned right. You can import numbers from your spreadsheet as they are, but then round big numbers like billions and millions for easier readability. People have a hard time figuring out a billions, so it is always safe to round them to something like "12,4 billion". With this feature Datawrapper helps you to achieve just that. To be fair: Excel and all other spreadsheet software would provide similar features, but usually not with one click. So it is in almost all cases better and easier to perform this transformation here, in Datawrapper. Dividing numbers provides options to correctly switch from very large numbers to shortened, easier to read numbers. Simply divide the original. 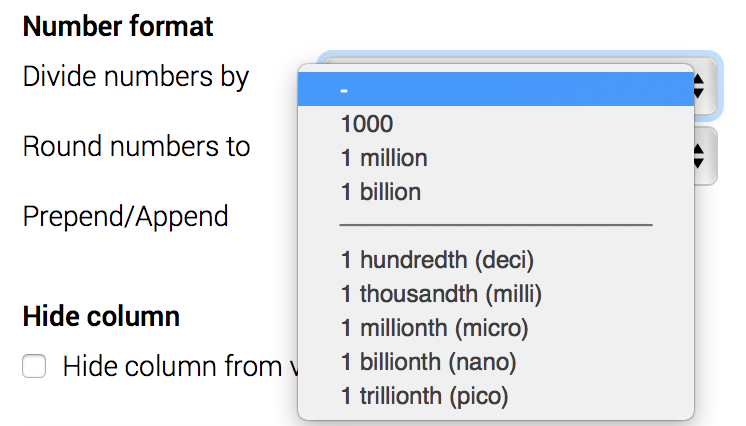 This defines how many decimals are shown after the thousands separator, as shown in the options of the drop-down menu. This is another way to represent the numbers in an easy to understand way. Significant digits are e.g. used when you have a number of 0.00700 km. If you apply the concept of significant digits this would be 7,00 Meters. So, in both cases the number is correct, but the second one would be decidely easier to read, without sacrificing any information. If you haver heard of significant digits invest a few minutes of your time to learn more about this via a video from Khan Academy, which makes it clear what this is all about. This feature enables you to add e.g. a Dollar, Euro or % sign (or any other if needed) to describe what the numbers are. This can be helpful. Consider though that if all your numbers are the same this information can be easily given through the intro text or the notes text. In some cases it is important to show the type of number, but always look at your chart to be free of redundant info like this. Less is more, usually. You can add an empty step between number and sign, if that is the correct annotation. You might have uploaded a range for data columns, but later find, that some are making the whole representation too complex. So, here you can "hide" a certain column. It will not be considered in the chart then. Note that it is always better to upload just the numbers that are really needed - the option above is something like a quick fix only. If you transpose your data table (which means switching the X- and Y-axis) the settings made here will have to be re-assigned. Always firstly check whether your data structure is ok, then eventually go back to step 2 to perform the options such as rounding, division, prepending, etc. for the final touches. What about those options shown under the table in step 2? As described above "Transposing" switches the x- and y-axis of your data. This is actually needed to display data properly in some chart types. The best indicator that your data is not in the right order is when a bar chart or line chart "looks funny". You have a second option to transpose in step 3. To create a chart type you can look up the specific tutorials for bars, lines, etc. where the needed data format is always part of the information. There is a separate tutorial for this feature. Based on your data you can calculate an additional view, such as the average. This can for example be used in tables. There is a separate tutorial for this feature.